The wide range of Hartley accessories for your greenhouse. Having ensured the finest lasting care and protection for your plants with a unique Hartley structure, the interior working environment needs equally careful consideration. 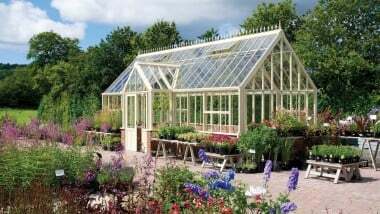 Highly experienced amateur and professional gardeners will already have a picture in their mind’s eye of the important accessories and finishing touches their greenhouse requires, even so this is an area where our experience and advice can help you to create the environment that’s ideal for your particular needs and aspirations. Our greenhouse accessories and tools are designed and manufactured to the same exacting high standards as our greenhouses, the sturdy shelving and staging utilising strong and maintenance free aluminium alloy extrusion similar to the main structure. Whatever you need to maximise growing and storage space, work more efficiently and successfully, and derive more pleasure from every hour spent in your greenhouse, make sure it’s equipped throughout to Hartley standards. Add an extra touch of the traditional to your greenhouse with these cast vent levers. Hartley Botanic Victorian Roller Blinds for your greenhouse. A Hartley potting bench, the perfect accessory for your greenhouse. Premium quality aluminium staging and shelving for your greenhouse,.